Does anthropogenic climate change precede global warming? October 18, 2011. 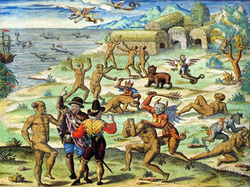 In a recent article in The Holocene and a subsequent paper given at this month’s Geological Society of America meeting, Richard Nevle presented evidence that apparently links the reforestation of the Americas following the European conquest of the New World with a reduction in atmospheric carbon dioxide and, ultimately, the coldest centuries of the Little Ice Age. Nevle’s work appears to support the general conclusions of William Ruddiman, who in 2003 argued that human beings have altered the world’s climate for millennia, largely through forest clearing. It’s worth noting that the warmer climatic regime that directly preceded the Little Ice Age waxed during an era of European deforestation, and that today’s climate is rapidly heating as forests in the southern hemisphere continue to shrink. Beyond the questions it raises within historical climatology and environmental history, the work of Nevle and Ruddiman is important for challenging the idea, so often raised by global warming skeptics, that humanity is incapable of altering the world's climate. Perhaps human beings, even in relatively modest numbers and well before the advent of industrialization, unwittingly changed the world’s environment on the grandest scale.